A ventilation system is only as good as the ducting used. 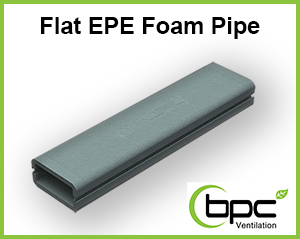 BPC Ventilation supply the most comprehensive range of quality ventilation and duct solutions and we can design a system to suit any type of property. Radial ducting is the latest innovation on ventiliation systems and can provide a quieter and more efficient ventilation system compared to rigid ductwork. Radial Ducting is a system of smooth bore pipes which are crushproof, semi flexible with zero air loss. 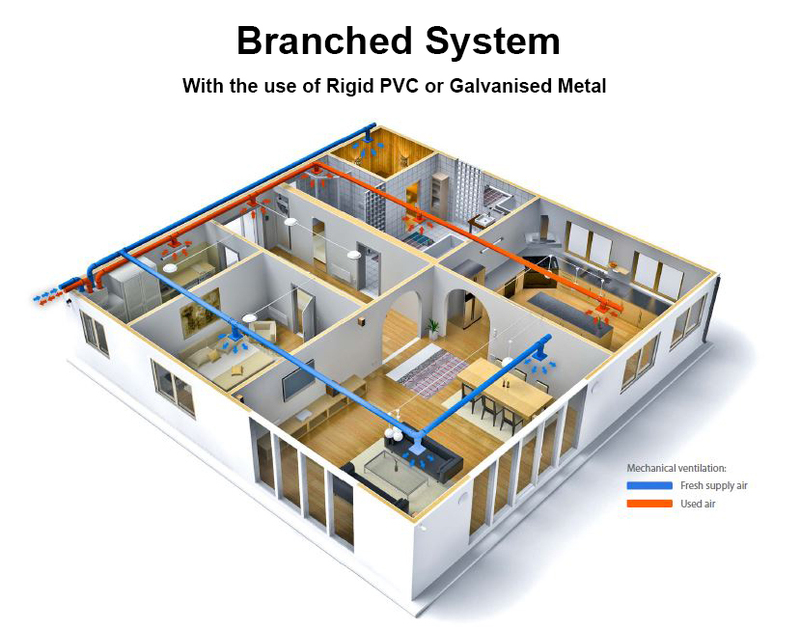 The pipes have an anti-static and antibacterial lining which individually connects each room to a manifold and are available in both circular (75mm or 90mm) and oval (51mmx114mm) fittings. 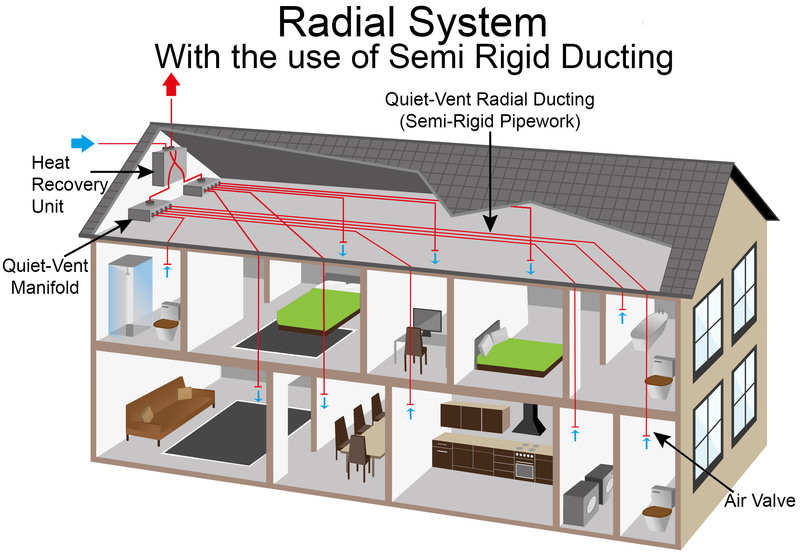 Radical ducting is suitable for any type of property; including timber framed houses, passive house approval homes and can be used in areas with limited access. Do not confuse this ducting with flexible or semi rigid aluminium ducting. Rigid/branched ducting is commonly used and is a cost-effective ductwork solution on ventilation systems. 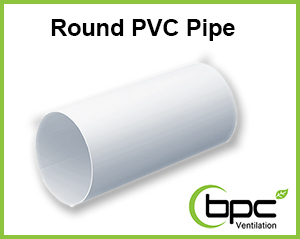 Is a system of round or flat PVC or EPE rigid ductwork which are typically 150mm or 125mm which branch out with T-pieces into various rooms. 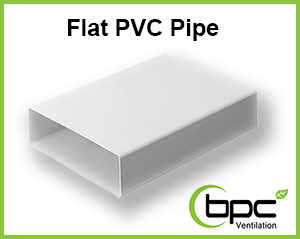 PVC Rigid ductwork has been used for over 50 years in domestic installations. PVC rectangular range available for areas of limited height. There are a couple of pipes to choose from with the branched system: Round PVC Pipe and Flat PVC Pipe. Used between studwork walls and below concrete ceilings to allow for ceiling heights to be maintained. Thermal ducting is commonly used within the Radial Duct System and is constructed of EPP foam which provides a quality air supply with a high thermal resistance. 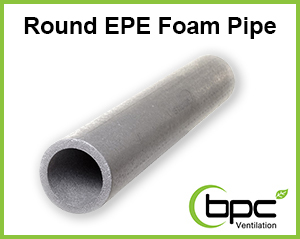 There are two types of thermal piping including Round EPE Foam Pipe and Flat EPE Foam Pipe. 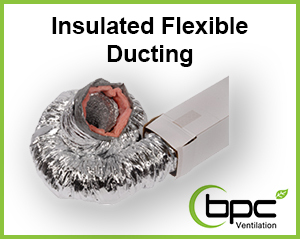 BPC Ventilation also provide a couple of accessories for your ducting needs including insulated flexible ducting and thermal insulation with a silver foil face. Thermal insulation is commonly used to insulate pipes which are outside the heated enveloped (cold areas). All solid rigid ducting outside the heated envelope have to be insulated and there are two types of insulation. Bubble wrap - A cost efficient solution of air bubbles trapped between silver foil faces providing good reflective properties but poor thermal resistance (not recommend or approved for new builds). 25mm Ductwrap- The original insulation used in both domestic and commercial applications. 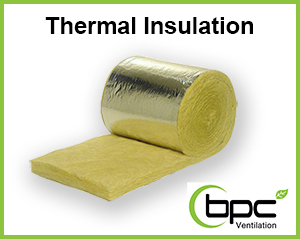 With good thermal properties and sound attenuating the 25mm thermal wood insulation with a foil face is renowned as the best insulation available and is used in both domestic and industrial ventilation systems. This is an expensive option in both the product cost and the time taken to install but is a life time option.